The ISS is in low-Earth orbit. This means that even though it is in space it is still subject to Earth’s gravity and is falling back to Earth, but it is traveling at such speed (approx. 17,500 mile per hour) that it is actually falling around Earth. It is typically 250 miles above the Earth’s surface, and because the Earth is rotating beneath it, every time the ISS orbits the Earth it is over a different part of the Earth’s surface, and it passes over 90% of the Earth’s population. 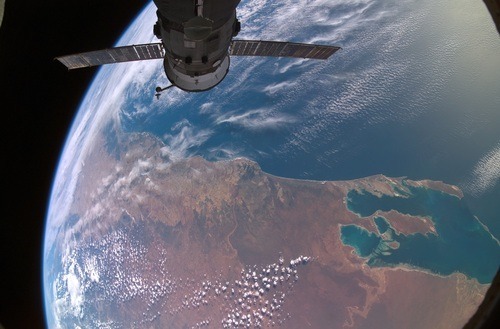 This means the astronauts on board have an ever changing and very spectacular view, and have taken millions of photos. The ISS is the result of over 20 years of international co-operation between 16 countries (the USA, Russia, Japan, Canada and major European countries). It has cost over $100bn to build and operate. We cannot think of another scientific project of a similar cost or scope. The closest we came is the $10bn Large Hadron Collider in CERN, but this is a purely European venture. The ISS does actually have a scientific value. Aside from all that has been learned in the development and construction of such a massive facility in space… it has been used to conduct science research in areas such as material science, drug discovery and Earth observation. The microgravity laboratory has hosted more than 2,400 research investigations from researchers in more than 103 countries. In addition, a huge amount has been learned about how humans change and adapt to long duration spacefights, which is of huge value as we plan missions to Mars and beyond. The ISS is massive. The solar array wingspan (240 feet) is about the same length as the world’s largest passenger aircraft, the Airbus A380. The space station is 357 feet end-to-end, one yard shy of the full length of an American football field. The ISS can easily be seen in the night sky with the naked eye. You just need to know where to look for it, and handily NASA has developed a great Spot the ISS service – simply enter your email address and home location and you will receive notifications when the ISS is due to pass overhead at night. The ISS is typically staffed by a crew of six professional astronauts, who keep the station in good working order, and conduct the science experiments. 230 individuals from 18 countries have visited the International Space Station. It has also served as the destination of seven private citizens (on eight missions, as one flew twice). Each private citizen was a customer of Space Adventures, and flew to the ISS on a Russian Soyuz spacecraft. See a video about their experience. The ISS serves as a great location for a music video as demonstrated by Canadian astronaut Chris Hadfield, who in his spare time during a 6 month stay recorded this hugely popular viral video. The ISS is a government program, but it was built and is managed by private companies under contract to respective government space agencies. NASA has taken this one step further and started to purchase “Commercial Off-the-shelf Transportation Services” (COTS). This basically means is paying a firm fixed price to a company to deliver cargo to the ISS. This has contributed greatly to the development of two new rockets and spacecraft – Orbital’s Antares and Cygnus, and the SpaceX Falcon 9 and Dragon. NASA is taking this one step further by applying the same concept to the delivery of astronauts to the ISS through its Commercial Crew Program. Boeing and SpaceX have been selected to transport crew to the ISS from the United States. As a result of the Commercial Crew Program huge steps forward have been taken in the development of new, re-usable manned spacecraft. These vehicles will be available for use by other space agencies and private companies.